"Timeless Images Of Unforgettable Men"
Father Lardie was indeed known as the 'Chaplain on the motorcycle' as shown in Hugh Halliday's excellent webpage, posted by Paul Cardin. However, conversation and correspondence with many MSG Veterans over time has revealed that, although he could be perceived as somewhat reserved in manner, he had a happy soul and was far from averse to joining in certain light-heated activities designed to ameliorate the relentless pressure a tour of bomber operations exerted on those in his charge. Not happy with his service issue push bike, (cycle), and fully intending to minister to his flock wherever they may be found around the 'drome at Middleton, he took himself off into Darlington one day and returned with a used, but very serviceable BSA motor cycle, believed to be a 350cc example. Now, not only could he now range far and wide where he pleased, he would also be able to take part in the officially frowned upon motor cycle races held at intervals around the perimeter track! Encouraged in this by his friend and partner in crime, Flt Lt. Gordon 'Suds' Sutherland, DFC, DFM of the Ghost Squadron , much fun was had, not only racing, but trying their best to find out exactly how many bods a motor cycle would take and be ridden successfully before they all fell off! But, he was never far from those whose souls, spirit and morale he always placed far above his own. No one whose time at MSG coincided with Father Lardie's will ever forget his upright figure, firmly astride his beloved motor cycle, heading out across the apron making for his charges, either waiting to go on their distant dispersals, or marshalled for take off on the perimeter track leading to one of the runways; 419 on one side, 428 on the other. He would have a word for all, whatever their faith, and we have encountered many Veterans, not only non-RC, but, total non-believers, who drew inspiration and moral courage from his very presence in their midst. A significant factor in this was that they knew the Father had also bought them a special last-minute gift, which, to miss out on may well mean that they would not return! As his motor cycle came to a halt among them, they would not only be enthusiastically greeting him, but waiting for him to open the RCAF issue small pack he always carried and begin to carefully give them their packs of his special “Two-Way Gum”! Father Lardie's Two Way Gum – once issued with this, many felt they had all the spiritual armour and encouragement needed to see the coming operation through. As is well known, superstition played a large part in the fragile existence of aircrew, and many were more than prepared to believe this chewing gum would indeed see them through. Evidence suggests that for many it did. Robbie Robson and his wife Freda, during a trip to Canada in the mid 1990s – mainly to see his Skipper John Sinclair, other RCAF friends and attend the Winnipeg Reunion – made sure that a visit to Father Lardie, living out his days in peace at St. Joseph's Villa, Dundas, ON was made. He was absolutely delighted to see them and a wonderful day was spent by Robbie and Freda in his tranquil company. Soon after, Father Lardie was gone. The fact that he went on operations – albeit illicitly – is well-known. This was just another facet of this quiet Priest's gallant soul. He had no need to do this, and not all Padres did it. He served a full year at Middleton, and touched the lives of all with whom he came into contact. A wonderful man, we were blessed to get him” F/O A.J.R.Robson, DFC, RAFVR, 428 (Ghost) Sqdn. RCAF. 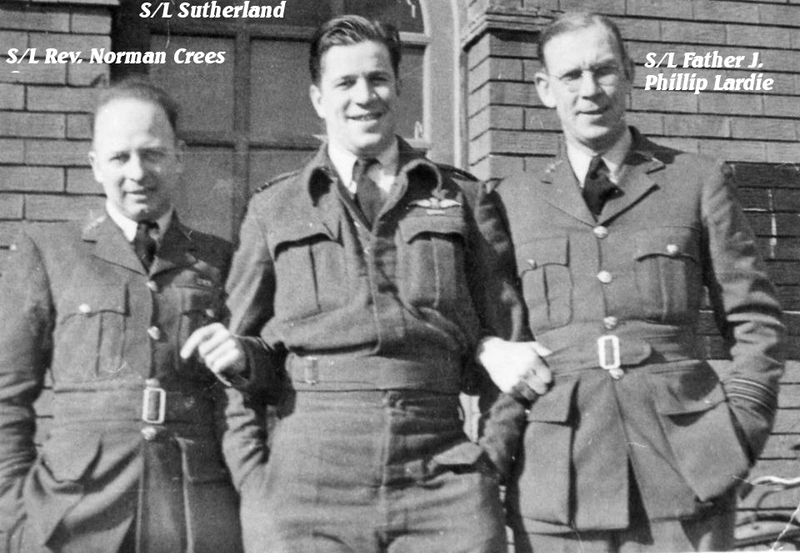 Father Honourary Squadron Leader J. Philip Lardie, MiD, RCAF. 1912 – 1998.